Happy Birthday Field Museum! Join us in celebrating their 91st Anniversary, our 175 Days to Love Chicago pick for Wednesday, May 2. Chicago’s Adler Planetarium has a wealth of hands-on activities and experiences for families with younger children. Crawl, climb, try on a spacesuit backpack, drive a rocket, or peer at NASA artifacts through a magnifying glass. Read on to discover some of the Planetarium’s activities and shows that are especially geared to kids 3 and up. Take a behind the scenes look at the Discovery Channel’s Emmy-nominated show Mythbusters when Mythbusters: The Explosive Exhibit comes to the Museum of Science and Industry, opening March 15! 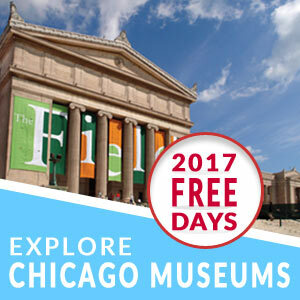 From viewing the Art Institute of Chicago’s collections, to visiting animals at Shedd Aquarium, there are a lot of fun things to do at Chicago museums. Here are the museum free days for Monday, January 16 – Sunday, January 22. From visiting Sue the T. Rex at the Field Museum, to exploring outer space at the Adler Planetarium, there are a lot of fun things to do at Chicago museums. Here are the museum free days for Wednesday, January 11 through Friday, January 13. What’s it like to work with sharks? We asked Lise Watson, Collections Manager of Wild Reef at Shedd Aquarium to answer that question. Chicago’s Shedd Aquarium is among the world’s largest indoor aquariums, housing more than 32,600 aquatic animals representing more than 1,500 species of fishes, reptiles, amphibians, invertebrates, birds and mammals from waters around the world.